Just for once it didn't rain. 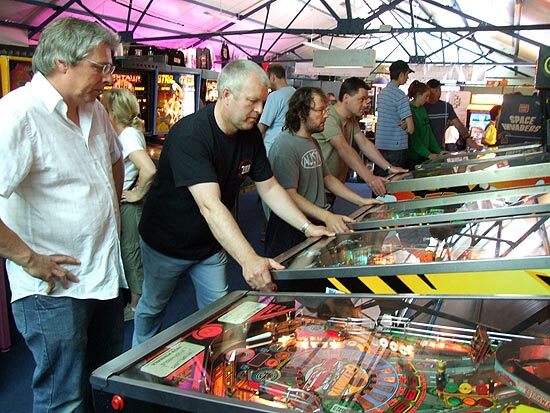 As you can see below, this year's Pinballers Anonymous Monster Meet took place over a holiday weekend of almost uninterrupted good weather and warm temperatures. 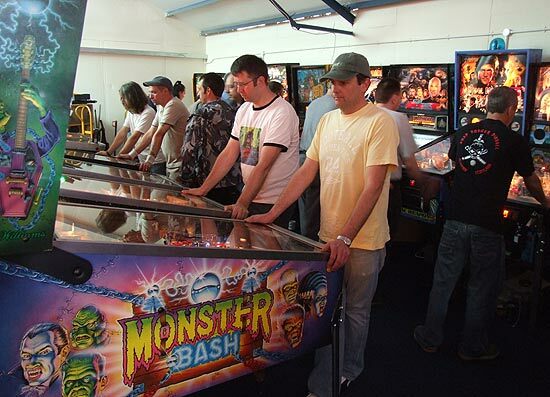 The Monster Meet, now in its fourth year, is one of the highlights of the UK pinball calendar and is the chance for people who only get together through the internet, or for a couple of hours at a League meeting, to spend a day or two playing, talking and relaxing. Organised by Pins Anon's Nick Bennett, the event runs across three days of a public holiday weekend - Saturday to Monday - although a couple of people turned up a day earlier to help set things up. Entry cost £5 per day up to a maximum of £10, so if you attended Saturday and Sunday, Monday was free. The fine weather allowed various outdoor pursuits including camping in a nearby field and a friendly outdoor poker game which lasted into the evening until it was too dark to see the cards. While it was looking pretty nice outside, it was just as good inside where the building had been cleaned up and prepared for the invasion. The clutter had gone and it made way for a selection of over 40 machines for visitors to enjoy. In addition, a number of people including Chris Williams and Adrian Godwin spent several hours working to get a Gottlieb Volcano up and running, which they managed with some success. 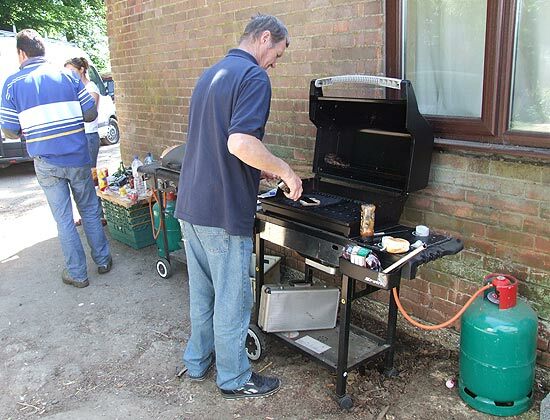 For those who wanted more than casual playing, a covered area allowed people to sit and talk, while nearby a barbeque area allowed various burgers, sausages and meats to be cooked. Inside, the kitchen area was well stocked with food and beverages, while two large refrigerators kept the burgers fresh and the cool drinks nice and frosty. There was a large communal stack of burger buns and numerous assorted foods were brought in and shared with everyone over the course of the three days. On the way to the seating area, a selection of drop targets and game ROMs were on sale if you needed either, while spares could also be purchased from the Pins Anon store along with special Monster Meet mugs. 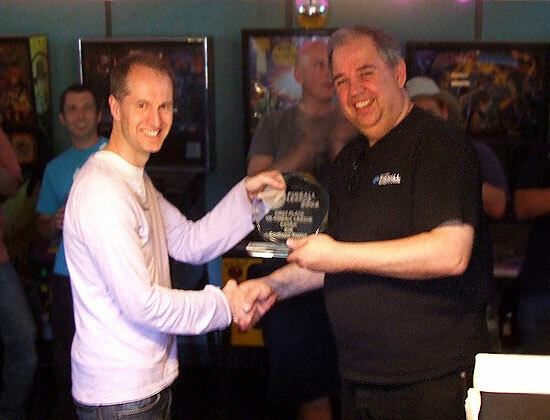 Saturday afternoon saw the first of the weekend's tournaments - the final of the UK Pinball League. 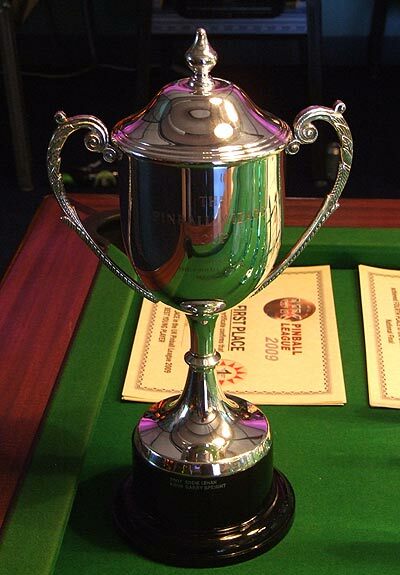 The League is run in five different regions of the UK and at the end of the season the top players from each region come together to compete in the national final. 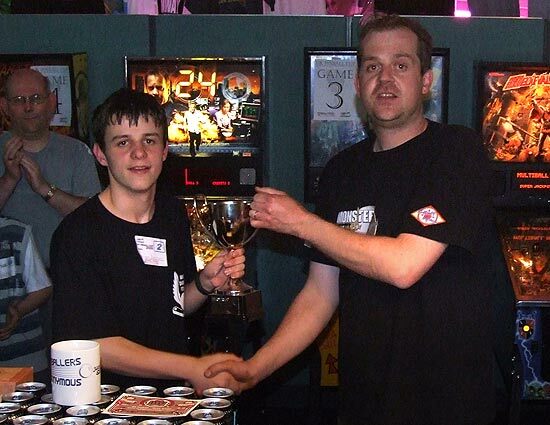 This was previously held at the UK Pinball Show but with this year's EPC tournament dominating competitive proceedings there, it was decided to hold the 2009 League final at the Monster Meet instead. Consequently, 20% of the League's meeting fees went to cover some of the Monster Meet costs. 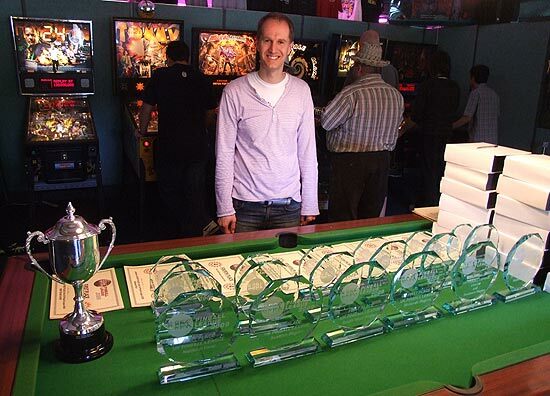 League Coordinator Greg Mott was in charge when the final got underway at 2pm and being one of the top South West region players, was also competing for the laser-etched jade crystal trophies, the accompanying certificates and the Pinball Wizard Cup, donated by Pinball Wizard magazine. Phillip Eaton and Adeline Prevost provided the computer scoring system which displayed the individual machine and overall player scores as the tournament progressed. 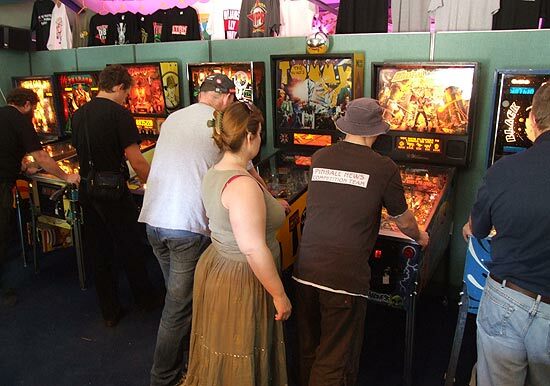 Each competitor played a single game on each of the five selected machines, which were Revenge From Mars, Attack From Mars, Star Trek - The Next Generation, The Shadow and Medieval Madness. 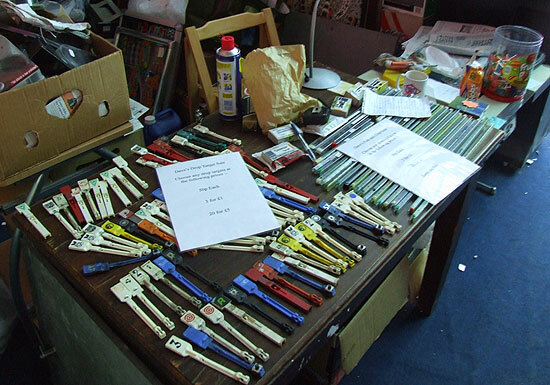 These machines were chosen as the most representative of the machines used throughout the League season. As many of the players finished their games, they came to the computer screen to see how they had performed. Each of the 17 players' scores were ranked against all the other scores and given ranking points, ranging from 17 points for the highest score to 1 point for the lowest. When all the results were in, it became clear that the top position would be decided not by who had the most high scores, but who had achieved the most consistently good scores. Before the final awards were given, the players from each region received awards for their performance over the season. After the regional awards it was time for the top four finishers in the day's final to be announced and given their trophies. In fourth place in the national final was Stan Simpson from the London & South East region. In third place was Northern region champion William Dutton. Second place went to the Midland Region winner, Nick Marshall. 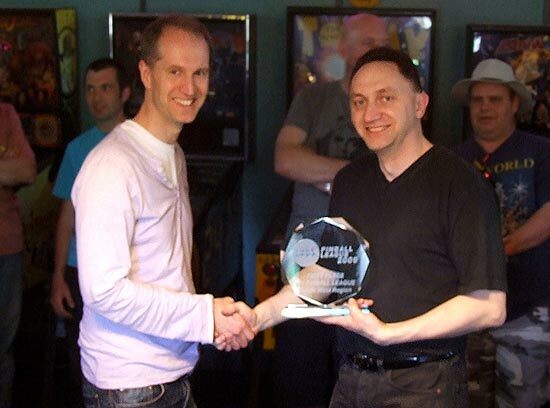 Which meant the 2009 UK Pinball League champion was the winner of the London & South East region, Martin Ayub. 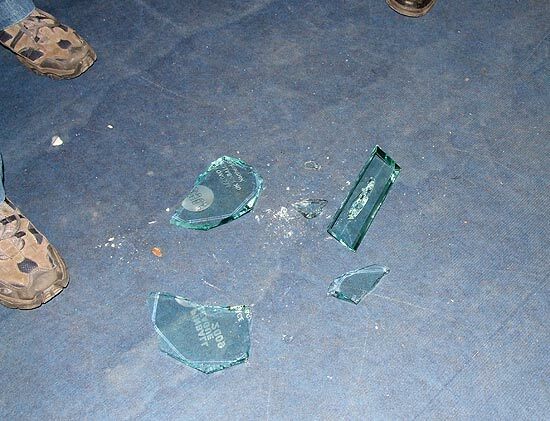 One unfortunate slip saw one of the trophies awarded earlier ending up in several pieces on the floor. It was quickly cleared up, the floor vacuumed and a replacement trophy is on the way. 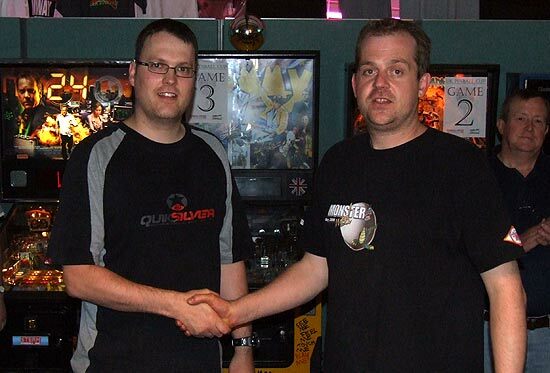 After the league final, the five tournament machines were returned to normal play and the day continued as before. Some visitors stayed overnight in the venue, sleeping under machines, in vans, or camping nearby. Others returned home or spent the night in nearby hotels. For those who stayed, the first full day of the Monster Meet finally drew to a close around 3am. Sunday was another beautiful day and before long the sound of flippers filled the air as players got back to the games. 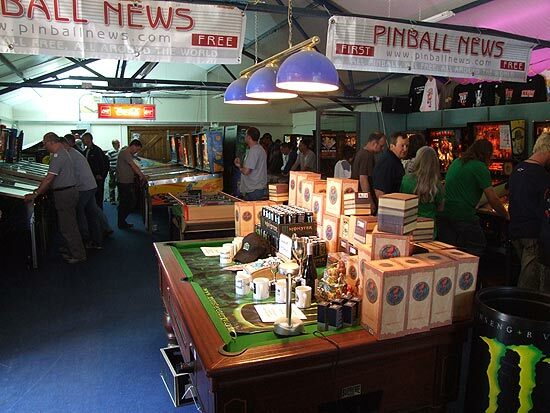 While Saturday was League final day, Sunday was the day for the UK Pinball Cup, organised by Pinball News. Entry to the Cup was free for all Monster Meet attendees and players could choose their own lucky player number between 1 and 99. 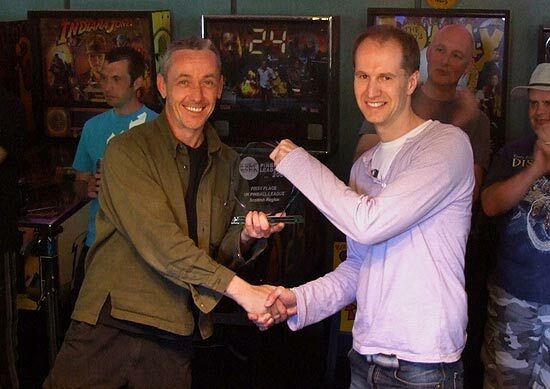 A large number of prizes were donated which ensured everyone who played had the opportunity to win something. Prizes were donated by Adrian Donati (fantasy figurines), Monster Energy (drinks), Pinball Renaissance (assorted toys and games), Pins Anon (cake and mugs), PAPA (baseball caps and PAPA registrations), John Blakeley (Pinball wine) and Lee Fensom (Nivea products). 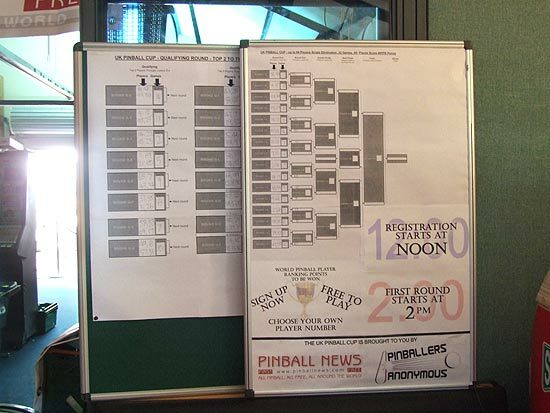 Registration for the UK Pinball Cup began at midday on Sunday and the draw for the qualifying round took place at 2pm. The Cup is fashioned after the FA Cup football tournament where numbered balls are randomly drawn - lottery style - to decide the groups of players and the machines they will play. 16 machines were used in the Cup: Dracula, Medieval Madness, Tommy, Indiana Jones, Stargazer, Lethal Weapon 3, Star Trek - TNG, Revenge from Mars, Rocky & Bullwinkle, Tales of the Arabian Nights, Centaur, High Speed 2 - The Getaway, Indianapolis 500, Attack from Mars, Theatre of Magic, The Flintstones. At the close of registration, 68 players had signed up. This resulted in the qualifying round consisting of 12 groups of 4 players and 4 groups of 5 players. 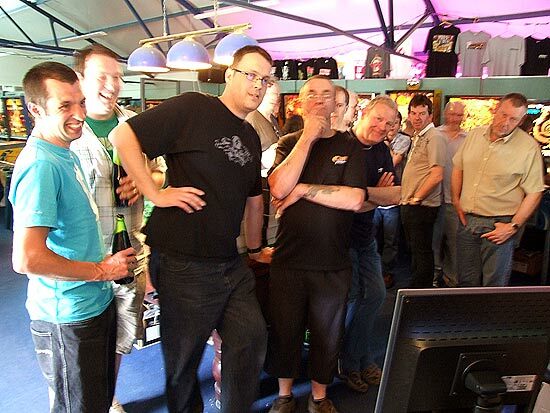 Each group played on their chosen machine with the top two scorers going through to the next round. Where five players were grouped together, two of them played the machine first followed by the other three. After the qualifying round, all subsequent games were straight head-to-head knockout, just like the football tournament. From this point on, only the machines to be played needed to be drawn before each round began. The 32 qualifiers were soon reduced to 16, then down to 8 and then to just 4. These last 4 played in the 2 head-to-head semi-finals, with the winners going into the final and the losers entering a play-off for 3rd and 4th places. 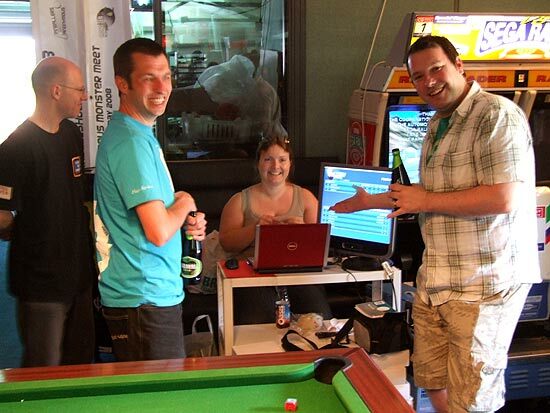 As contestants were eliminated they were invited to choose from the selection of prizes arranged on the pool table. 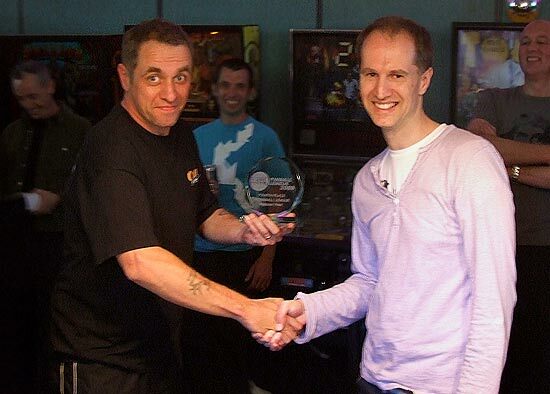 The final was between William Dutton and Martin Ayub on The Flintstones and the play-off was between Nick Marshall and Garry Speight on Stargazer. Both machines were drawn at random from the machines none of the 4 had played so far in the tournament. 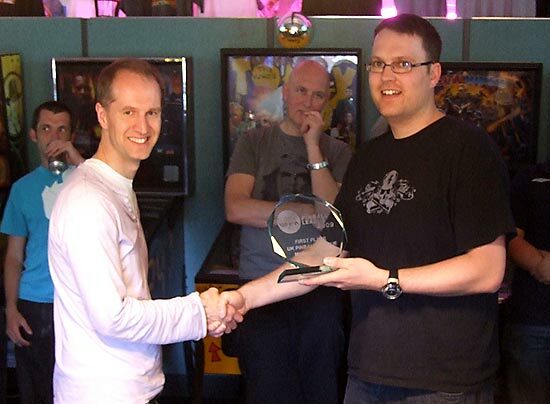 In the play-off, it was Nick - who had clocked the Centaur he was playing in an earlier round - who triumphed to take third place. In the final, William played second and took the lead at the end of the first ball. 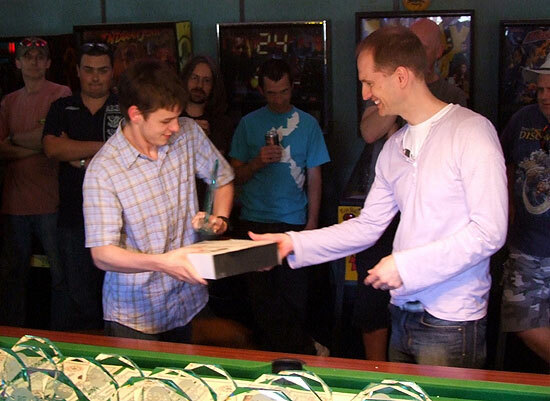 He maintained that lead through the second ball and despite Martin's comeback on his third ball, William overtook his score to win the final of the UK Pinball Cup 2009. 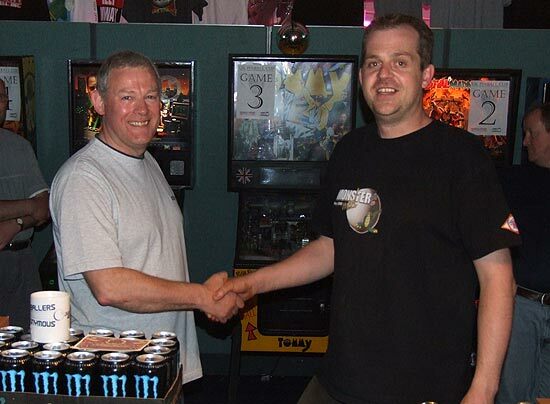 Once the final was over, prizes of figurines, Monster energy drinks, PAPA hats, Pinball wine and Monster Meet mugs could be awarded to the last four in the tournament by Monster Meet organiser Nick Bennett of Pins Anon. 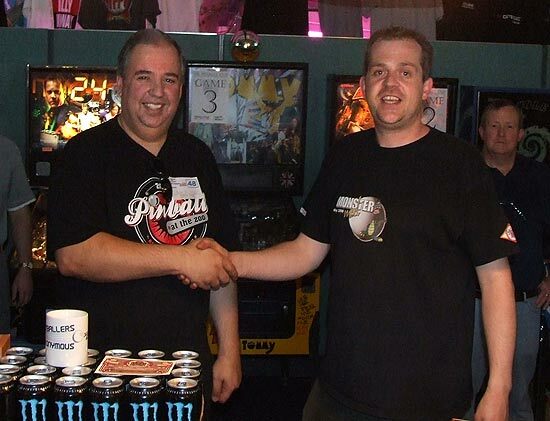 The top eight players also won free PAPA registrations and two division entries, while all players scored WPPR points for their efforts. 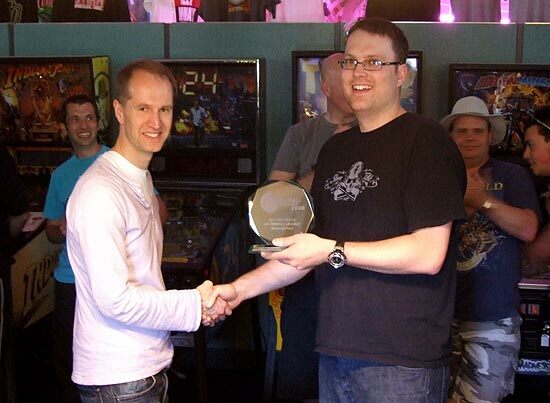 So William Dutton won the UK Pinball Cup and will have his name engraved on the trophy. 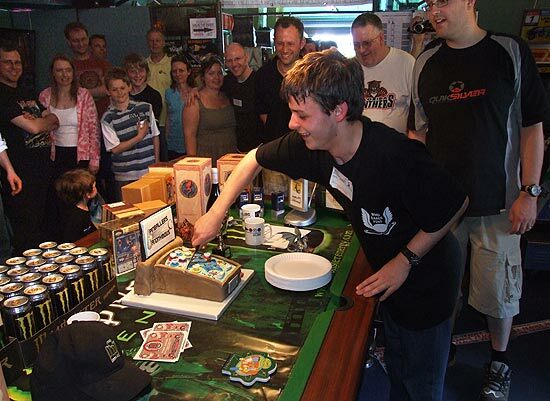 He also received a small replica of the cup and the honour of cutting the special pinball cake. After the presentations and the cutting of the cake, the sixteen Cup games were put back into general play and the Monster Meet continued into Sunday evening. Monday is generally the most relaxed day of the three and this year proved no exception. 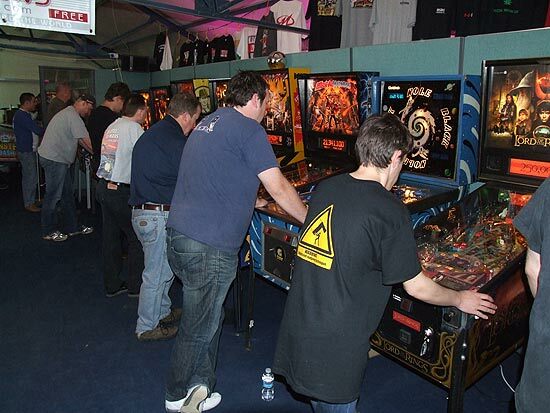 Fewer people visited on the final day which meant there was no problem getting a game on your favourite machine. The casual atmosphere didn't stop the competitive action though, as two mini-tournaments took place. The first was a cross-handed competition played on Attack From Mars. No practice was allowed and only one game for each of the 27 players was permitted. 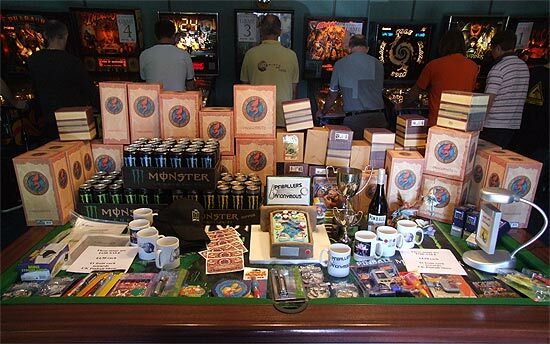 There was no entry fee and the prizes included Monster Meet mugs and fantasy figurines. The winner was Clair Thomas with her score of 1,038,300,350. In second place was John Hawkins on 892,430,960 while third place went to John Thirkettle with his score of 856,278,010. 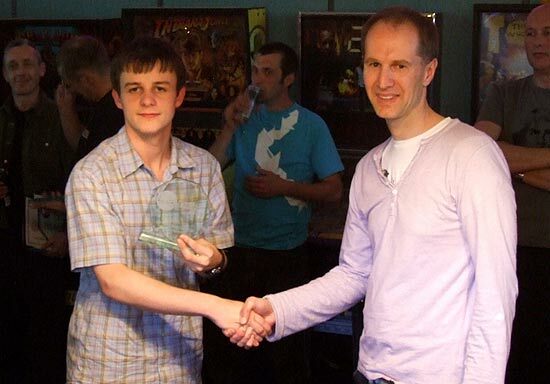 A little later in the day, the second mini-tournament was played out on Dracula. This time it was a one-handed challenge but like before, no practice was allowed and the 26 competitors could only play the one game to register their score. 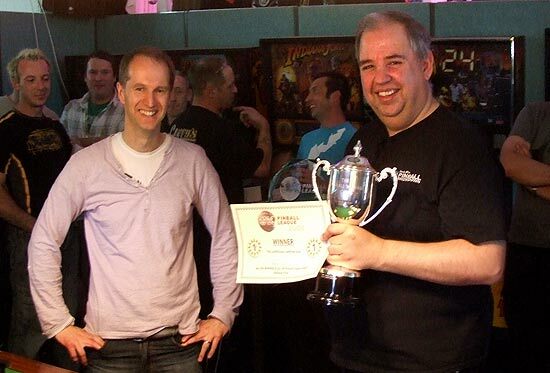 A different trio of players took the honours in this event with Andy Foster winning with his 59,769,180 score. Second place went to Harriet Hawkins on 28,118,080 and third was the 20,718,500 score by Janne Toukkari who flew in from Finland for the event. The Monster Meet finally wound down and came to an end on Monday evening. Everyone declared it had been the best Monster Meet so far - the best selection of machines, the best space to host it in, the best turnout and the best atmosphere, all helped of course by the best weather. 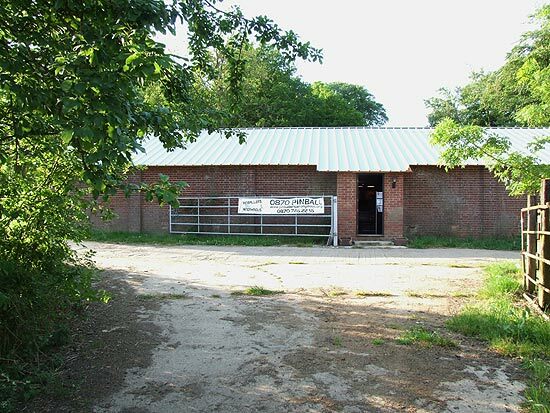 It clearly takes a lot of preparation and effort to turn the workshop and storage area into a venue suitable for a three day meeting and to get all the games up and running. 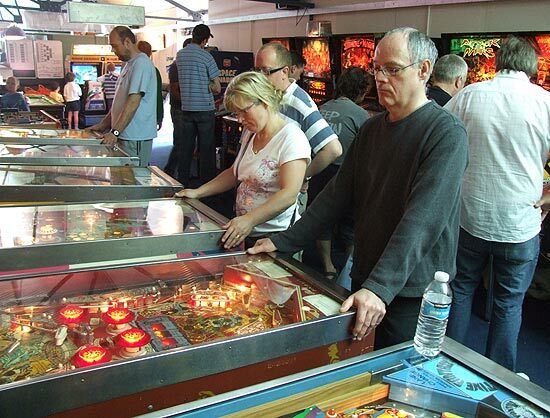 There were very few mechanical problems and those that did materialise were quickly fixed, either by roaming tech Andy Netherwood of Pinball Mania or by one of the technically-savvy visitors, of which there were plenty. The Monster Meet will be back in 2010 and is expected to be the same public-holiday weekend at the end of May, which will be the 29th to the 31st.